Музыка в mp3 с компакт-диска "Пробую звуки на вкус и цвет..."
Solo Ensemble. Boris Rayskin (cello, electronics), Recorded live. Berlin Jazz Fest 1993 - 3'57"
Armenian Lament. Boris Rayskin (cello, electronics), Studio recording by Slava Egorov, Montreal, 1994 - 4'48"
Baroque. 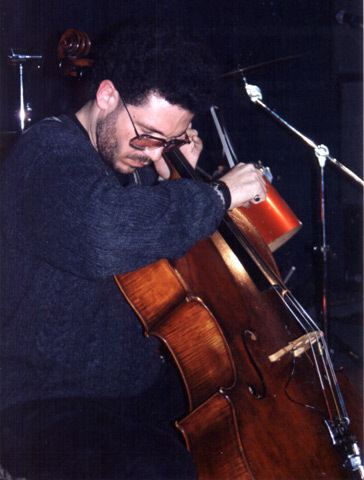 Boris Rayskin (cello, electronics), Home Studio Recording, New York, cello, electronics, 1995 - 6'15"
No Nothing. Just Blues. Boris Rayskin - cello, electronics, Arkady FreeMan (Кириченко) - vocal. Recorded in Birmingham, Alabama, August 1996 - 5'27"